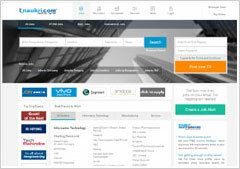 Naukrigulf.com is Info Edge's foray into the Gulf market. Founded in 2006, it has grown to be a leading player in the region and is focused on the six GCC countries with the UAE being its strongest and biggest market followed by Saudi Arabia, Qatar, Bahrain, Oman and Kuwait. Being a local job board, it primarily caters to Gulf-Gulf hiring, i.e., people in the Gulf looking to find jobs in the Gulf. The site has members spanning more than 150 nationalities including Arabs, Europeans and people from South East Asia. It has over 30,000 vacancies at any given point of time - a leading figure amongst the jobsites in the region. Naukrigulf.com is fully localized with an Arabic jobseeker section and its iOS and Android apps have been clocking top rankings since inception. The site is supported by regional sales offices in the UAE, Saudi Arabia and Bahrain along with a successful inside (or remote) sales operation based out of Noida.